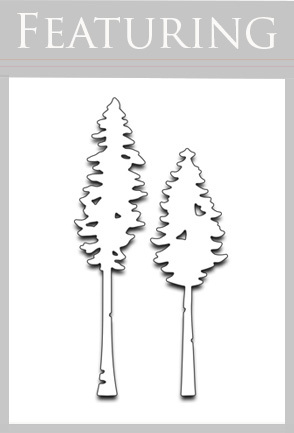 It's double the designing fun as we reveal two cards using the same Penny Black Creative Die; Tall Trees. For this card, I inked my background using Distress Inks (Wild Honey and Spiced Marmalade) using an ink blending tool and a foam pad. The trees were inked with Forest Moss and Peeled Paint Distress inks and the trunks colored with a marker. I hand cut a snowbank and adhered it to the bottom of the scene using dimensional adhesive. Penny Black's die cut snowflakes were used to embellish the card. And I just couldn't resist pairing the die cut moose with the tall trees! 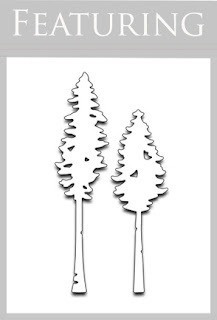 Next, I've used Tall Trees on a tag. More inking and masking with Distress Inks make up the background for this tag. I also splattered the background with water to give the look of falling snow. I think the small stamped bird from Penny Black's transparent set 30-261 Nature's Friends, might be my favorite part of this tag! This feathered friend was stamped with Memento Nautical Blue ink. The trees were inked with Nautical Blue ink, pressing the ink pad directly onto the die cut pieces so a dark rich color was achieved. A hand cut snow bank stamped with a beautiful Penny Black sentiment (using VersaFine Onyx Black ink) finishes off this Tall Tree tag. Elizabeth and I have lots more STUDIO holiday happenings headed your way... see you soon!